Want to make a piece of jewelry and have some fun with your friends? This class will give you a chance to learn some traditional metalsmithing techniques, demystify the world of jewelry making, and spend a creative evening in my studio with your friends. You don’t need any previous experience with jewelry making or metalsmithing. During the three-hour session, you’ll learn how to saw, hammer, drill, and shape metal confidently. 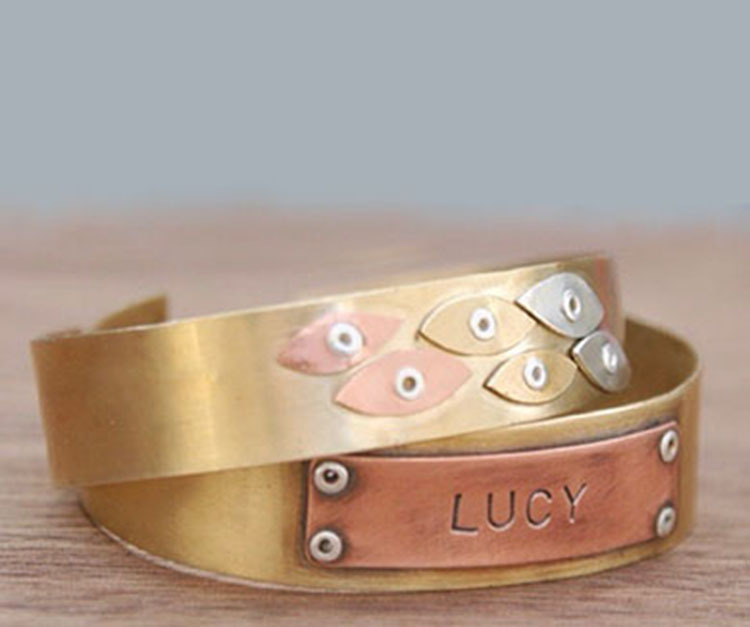 The evening will focus on a cuff bracelet that each of you will make, and you’ll make your piece “your own” by adding whatever embellishments or details you can dream up. You can cut custom shapes, stamp words or names, or even incorporate tiny treasures that you bring from home into the design. Get creative! Nervous about using tools and fire? Not to worry, we will be using jewelry-making methods that don’t require the use of fire, and I will teach you everything you need to know about the tools and techniques you will utilize. At the end of the night, you will leave with a gorgeous bracelet — the product of your own creative work. What do you say we make a night of it? $90 per person, up to five people in a group. Must be 14 years or older, must have at least three people in your group to reserve session. To discuss possible dates that would work for your group, use the contact form.